Hot Drinks Taste Better From A Camera Lens. You Only Get One Shot At The First Coffee Of The Day - Might As Well End It With A Photo Finish! Sharpen your focus with a Camera Lens Coffee! This 99.9% replica travel mug looks exactly like the Canon 24-105mm camera lens. Complete with focus ring and grip, both coffee lovers and camera enthusiasts will get a kick out it! Stainless steel interior is easy to clean and keeps drinks hot for longer. 2 different screw-top lids keep your coffee safe while you run like the paparazzi headfirst into the day. The Strata Camera Lens Cup is one of the most popular gifts for photographers! The surprisingly realistic design ensures it sits pride of place with any photography fiend. But you don’t have to be a photographer to enjoy this unique design. Coffee and tea drinkers love the screw top lid and stainless steel interior. Drinks stay hot and safe inside the cup without spilling! And if you have an inspired young shutterbug at home – not yet old enough for coffee, this mug also takes cold drinks! Your kids will love running around like a professional looking photog. Also great as a pen holder! 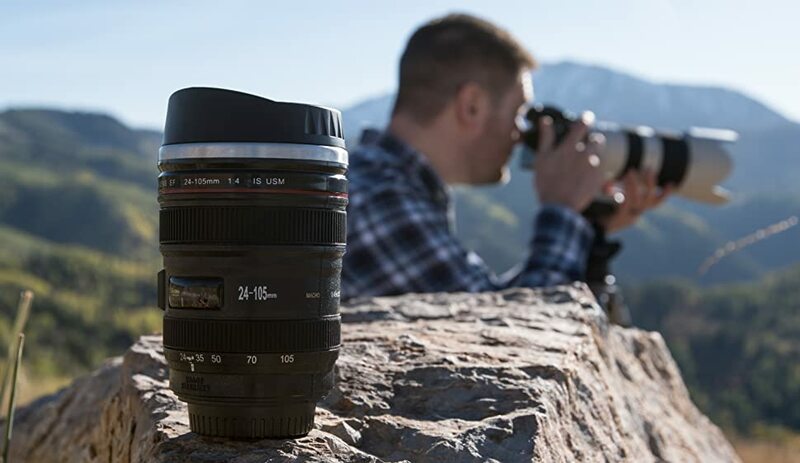 It’s true, your cup really is the closest thing to the Canon EF 24-105mm f/4 L IS USM Lens! The only difference… this is a lens anyone can afford! Warning: Just like the Canon lens – this replica is not designed for microwave, or dishwasher. What are you waiting for? This Unique Coffee Mug is Perfect!